Sharpe wants people to realize they may live a long time and “scare” them into saving more, working longer, and/or being more careful with their portfolios. Here is the example chart given for retiring couple with male age 66 and female age 63. 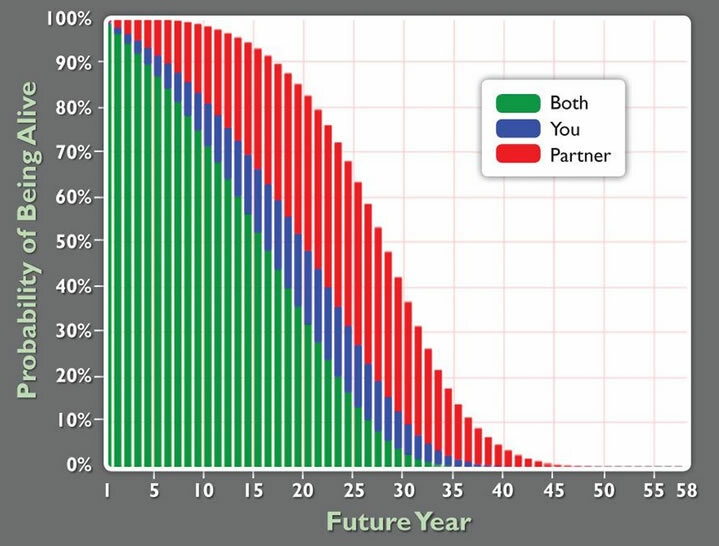 The green bars show the probability of both spouses being alive at a given year in the future. The blue bars show the probability of just the husband being alive, while the red the bars show the probability of just the wife being alive. As you can see, there’s a good chance (roughly 40%) that the woman will live another 30 years after retirement. That is a really long time. When I examine this chart, I have a different perspective. Being male, I notice that there is a roughly a 10% chance that I won’t make it to age 66. There is a 20% chance (1 in 5) that I won’t make it to 76. The idea of dying before I can actually enjoy retirement – that is scary to me. So yes people can “just” work longer, but also remember that your time on this Earth is limited and not guaranteed. There are many paths out there, but I don’t plan on working hard until 65 or 70 and then hoping I can relax for while before I croak.